Korean pop group BTS can't stop breaking records. 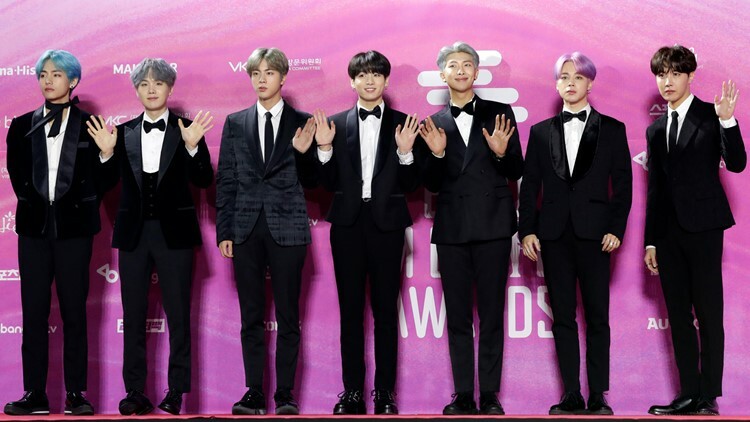 YouTube confirmed in a tweet Saturday that the seven member k-pop boy group's newest music video for "Boy With Luv" featuring Halsey racked up the most amount of views in a 24 hour debut in YouTube history. The video amassed 74.6 million views in the 24 hour time period. The group went on to debut their song on SNL later that night. They're the first South Korean musical guest ever to appear on the show. The video was also the fastest music video to hit 100 million views. It took the video less than two days. The group took the record from another k-pop group. BLACKPINK, a girl group, released their music video for "Kill This Love" on April 4, and previously held the record at 56,7 million views in 24 hours. BLACKPINK also made history this weekend when they became the first k-pop girl group to perform at the Coachella music festival in California. BTS, known as Bangtan Sonyeondan, Bulletproof Boy Scouts, Bangtan boys and, as of 2017, Beyond the Scenes, have broken numerous records in the past. heir album "Love Yourself: Tear" was the first Korean album to reach No. 1 on the Billboard top 200. They're also the first Korean group to have a platinum single and a gold album recognized by the Recording Industry Association of America (RIAA). Their music video for "Idol" is the fastest music video ever to hit 100 million views.